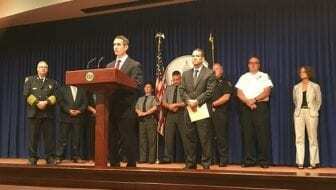 HARRISBURG, PA (WSKG) — After a series of meetings with teachers, administrators, and students, a school safety task force is calling for more mental health resources, better security in buildings and improved communication between school districts and police. A series of six meetings were held over the last several months, as school shootings in other states dominated headlines. Each included about 40 parents, teachers, and students. Among its recommendations, the task force’s report said schools need to share more information with law enforcement to identify threats, boost building security, and hire more personnel–from counselors to school police officers. There’s no dollar amount–but DePasquale said spending is probably unavoidable. “I don’t think any of us believe that there isn’t going to be additional money needed at some point. But we wanted to get these recommendations out, see where the coordination could already happen, and then as we hear back from schools as to what they need, then we can make some recommendations to the legislature,” he said. The most recent state budget included $60 million for school safety grants, some of which are already being used–largely for physical security improvements.